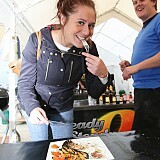 Woking Food and Drink Festival 2018 Foodies from the Borough and across the region turned out in their thousands to enjoy a large helping of celebrity and local chef demos, expert talks and a fantastic assortment of over 80 food and drink stalls, all served with a sprinkling of top-class entertainment. Woking Food and Drink Festival 2017 Foodies and families from across the South East turned out in their thousands for the Woking Food and Drink Festival 2017, proving that come rain or shine, there’s always an appetite for excellent cuisine. Woking Food and Drink Festival 2016 It was another record breaking and award-winning year for the festival! Check out the famous faces who took part in the event! 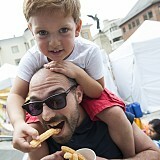 Woking Food and Drink Festival 2015 It was an award-winning and culinary triumph for the third annual Woking Food and Drink Festival, which attracted record crowds. Woking Food and Drink Festival 2014 It was 'sunny side up' for the 60,000 people who visited the festival from 5 to 7 September 2014. Woking Food and Drink Festival 2013 Over 20,000 people visited the first Woking Food and Drink Festival in September 2013.